Sideburns and ducktails invade Sherwood Forest as Robin Hood, his Merry Men, and the Sheriff of Nottingham, along with lots of assorted peasants and courtiers, meet the music of Elvis Presley. 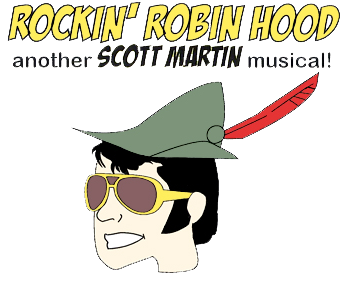 This musical melodrama promises to keep you cheering for the heroes and booing the villains as they sing song parodies from the 1950’s in their own Rockin’ Robin Hood style. Featured in the cast of Kentwood Kids ages 6-16 are Liam Baker, Melissa Cruz, Donovan Guiga, Logan Hannig, Lucas Hannig, Sarah V. Harnden, Dillon Hensel, Kalani Hildebrand, Osric Holt, Stephanie Hotz, Xander Karafin, Savannah Keown, Caroline Macou, Joe Olivas, Anthony Olivas, Gianna Pira, Grace Rector, Zoie Rivera, Claire Schaaf, Ethan Schyman, Kira Sherman, Hollister Starrett, Izzy Sumrall, Miller Vaughn, Skylar Washington, Rolin Weber, Parker Weldon, Isabela Welsh, Caitlin Welsh, and Javon Willis. Tickets are $10.00 with a special family four-pack of seats for $35.00. Please call (310) 645-5156 for reservations Tuesday through Saturday from 4-7 PM. Visa, MasterCard, and American Express accepted. Special needs seating is available in the front row and should be arranged with the box office at the time of ticket purchase. All audience members are invited to meet the cast in the theater lobby after the performance. Parents are welcome to bring a camera for photo opportunities during the after performance reception only. Marian (Grace Rector) and Robin (Dillon Hensel) are engaged at last. With voices like velvet, who can resist the charms of Robin Hood and his Merry Men? Robin and his Merry Men plot their next adventure - Dominos or Papa Johns? who will be the better Champion of the Poor and Defender of Justice. OMG!!! OMG!!! He touched my hand!! He touched my hand!! They're soooo cute!! The Sinister Sheriff of Nottingham didn't plan on the fierce moves of Victoria and the Sherwoodelles. Boys will be boys! With Will Scarlett and Little John egging him on, Robin pulls a prank on Friar Tuck. The Merry Men on a break after taking from the rich…..oh yeah, and giving to the poor. Maid Marian (Grace Rector) confides to her friends (Parker Weldon, Skylar Washington) about her love for Robin Hood.